Well, the spelling difference between beside and besides is a small one, but their meanings and uses are quite different! Let’s deal with this confusion and get rid of it. Beside is primarily used as a preposition whereas Besides is an adverb. • These problems seem petty beside ( = compared to) the profits we are going to make. BESIDES का प्रयोग informally एक और तरह से भी किया जाता है: to introduce additional information that supports your previous one. Well, I hope we cleared the confusion to some extent. 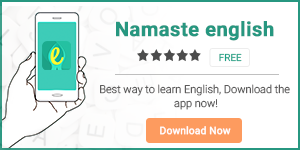 Download our English learning app Namaste English.